Adrenal Care by Blackstone Labs Hit the reset button on your tolerance to stimulants with Adrenal Care by Blackstone Labs. Growth by Blackstone Labs Increase your growth hormone production for a younger you with Growth by Blackstone Labs! 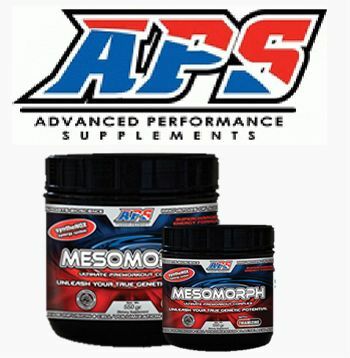 Mesomorph by APS Nutrition is the complete pre-workout that has earned the spot of the #1 ranked pre-workout on the market as it contains full clinical dosage amounts of ingredients that matter with NO unwanted fillers! Other Ingredients: Malic Acid, Natural and Artificial Flavors, Acesulfame-k, Sucralose, Silicon Dioxide, FD&C Red #40. Directions: Once tolerance has been determined, mix one scoop of Mesomorph® with 8-10oz of water, stir adequately, and consume on an empty stomach approximately 30-40 minutes prior to exercise. On non-workout days, consume 1/2 scoop Mixed in water on an empty stomach. Does your pre-workout supplement facts read like this: Blah, Blah, Blah, Blah, AND CAFFEINE? If this sounds like your pre-workout, then it probably means you have a product with a lot of filler ingredients and that is lacking a PUNCH! No fillers mean NO upset stomach, NO jitters, and NO crash. Mesomorph will help you push beyond what you thought your limits were, and beyond! APS Nutrition formulates a Pre-Workout that contains FULL doses of active ingredients. No half doses commonly seen in pre-workout supplements. Increase energy levels to heights unknown and push yourself to finish that last exercise like it was your first! See why everyone is going crazy over Mesomorph and experience more energy and pumps than you have ever had! Synthenox-Carnosin Oxide Complex: This phase allows you to recover quicker after intense training session. The complex also promotes muscle mass maintenance. This complex includes ingredients such as: Beta Alanine, L- Critrulline, Arginine, and alpha keytoglutarate. Mesoswell-Cell Volumizing ATP Matrix: The ATP matrix adds creatine to give you solid muscle gains and vascularity. You won’t just look feel pumped you will look pumped as well. ATP is an important enzyme that provides energy to the cell to use as synthesis of ATP. Maseowll-Cell Volumizing ATP matrixes consist of DL- creatine malate, L-taurine, creatine nitrate, and ascorbic acid. Neuromprph-Neuro Energized Stimulant Matrix: Phase three is going to provide you with increase energy and focused. Caffeine is the leading ingredient that will enhance you alertness, focus, and energy. Get serious pumps and energy NOW, at StrongSupplementShop.com! Warnings: Not intended for use by persons under age 18. Do not exceed recommended does. Do not consume synephrine or caffeine from other sources, including but not limited to, coffee, tea, soda and other dietary supplements or medications containing phenylephrine or caffeine. Do not use for more than 4 weeks. Consult with your physician prior to use if you are pregnant or nursing, or if you are taking medications, including but not limited to MAOI inhibitors, antidepressants, aspirin, nonsteroidal anti-inflammatory drugs or products containing phenylephrine, ephedrine, pseudoephedrine, or other stimulants. Consult your physician prior to use if you have a medical condition, including but not limited to, heart, liver, kidney, or thyroid disease, psychiatric or epileptic disorders, difficulty urinating, diabetes, high blood pressure, cardiac arrhythmia, recurrent headaches, enlarged prostate or glaucoma. Discontinue 2 weeks prior to surgery or if you experience rapid heartbeat, dizziness, severe headache or shortness of breath. Do not use if safety seal is broken or missing.